Apparently, according to this test, my "alignment" is "Neutral Good". I guess that works for me. The test linked above says I am 41.7% Good and 10.3% Lawful. "10.3% Lawful"? What's up with that? I suppose if you consider the ZAP a "law", and rejecting theft as "lawful", it could fit. Although I still tend to consider all "laws" as either unnecessary or harmful. Although there were several questions I couldn't easily answer, as there was no answer I really liked (as with all these things). So, perhaps I lean a little toward the "Chaotic" side, too. You do the best good that a person could be expected to do. You are devoted to helping others. You are willing to work with authority figures, but you do not feel any particular allegiance to them. You are the stereotypical “Benefactor.” You believe in doing good without any particular bias for or against order. Examples of characters and people who fit into the same alignment as you include Mother Theresa, Ghandi, Gandalf, Indiana Jones, O-Bi-Wan Kenobi, Luke Skywalker, Harry Potter, Frodo Baggins, and the Dalai Lama. Another page explains the character traits a bit more in-depth. Again, I think they confuse respecting "laws" with doing the right thing when the "law" accidentally aligns with right. And confuse finding "authority" irrelevant with willing to work with "authority". As a bonus, here is the page on "Chaotic Good", which I'm a little surprised I didn't score, but which I do seem to share a lot of characteristics with. 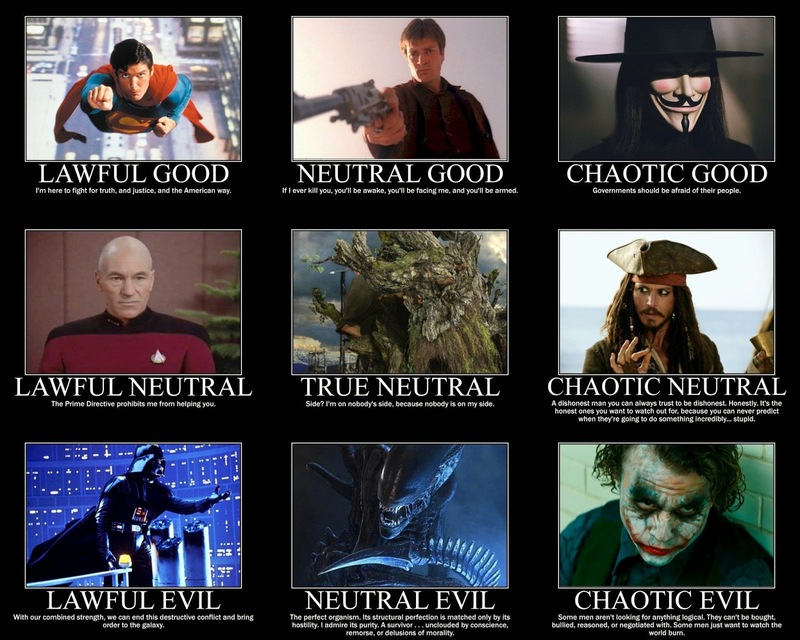 Someone showed me another alignment test, and in taking it I scored "Chaotic Neutral"- I am less confident of that result because the test had even more questions without a good answer for me. For example: I won't spy for a hostile foreign power because governments are all evil, not because of any loyalty to "my" government. Either way, I am some combination of good, neutral, and chaotic- the upper righthand corner of the picture, which I see as the most fitting place for me. Anyway, file it under "know yourself", and take the test if you'd like to compare notes.